The charm of the Europe Place is not only in its manifold buildings, in the beautiful inner courtyard of the Zichy Palace, in the view over the tower of the Town Hall, which from the distance marks the town's main square or in slim and charming towers of the church appearing from the distance. The cosy environment of the Place and its human dimension is created by the particular elements: the masterpiece grids, the xylography, the craftsmen tinner elements and the stuccoworker´s elements, the narrow small streets, the familiar spaces created by the statues, plants and the houses modest as such, however, of exceptional value in their mutual interaction. 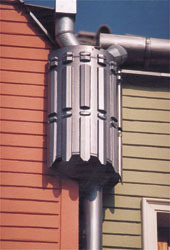 The architectural wealth and diversity of the Place is represented mostly in the details. Let us have a look up at the facades of the buildings and notice the forged works adapted to the architectural forms, the artistically treated wooden decorations, the stucco elements, the variety of different forms of windows, the colourful windows, craftsmen water holds and gorgoyles. The original solutions of buildings elements made by craftsmen are represented there, being the evidence of the virtuosity and demanding character of the traditional crafts; they prove the remarkably careful mastering of the professional skills. The colours of the facades have its symbolic meaning. The only white house in the Place (The Vatican House) represents purity and dignity. The restrained elegance of the pale ochre Welsh House is followed by the grey Scottish House made on the basis of the combination of the easy and massive elements inspired from the works of Charles Rennie Mackintosh. Next to it the pale green Irish House reflecting the magic of the emerald island is situated. 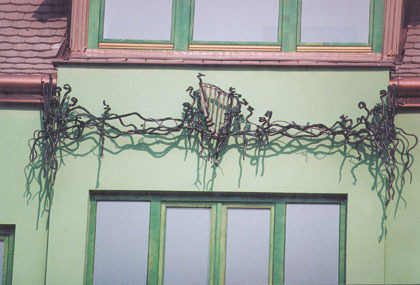 The wonderful forged element decorating its facade evokes the inhabitants of the island : a bard lives through the music and poetry in the heart of each Irish. In the neighbourhood the charming bordeaux English House is situated. The buildings inspired by the wooden buildings of the Northern nations (Island, Greenland, Denmark, Norway) are properly combined with a warm scale of the brick facades (Netherlands, Friesland) in the large areas of the walls, the steep fronts of the roofs and in the regular order of the separated windows. This architecture reflects the characteristics of the nations living on the territory of Netherlands: the realism, persevere purposefulness, independence and the generally known sense for order. The yellow Belgian House is situated in the neighbourhood; next to it the grey Finnish House referring in its solution of the main portals to the Finnish national romantics; the pale brown Estonian House and bordeaux Swedish House. There are the Latvian, Lithuanian, Bohemian and Polish houses here too. One of the largest buildings in the Place is the German House with its construction in the style of Lattice work „Fachwerk“. Its few decorations follow here directly from this construction : the red - brown colour of the visible wooden construction of the beams, the vertical and horizontal wooden reinforcement, the carpenter-like endings of the rafters. 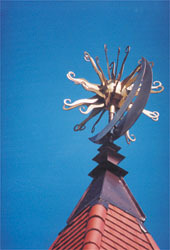 The top of the roof is crowned by the small charming church clock tower and with the small metal fag decorated with the number 2000, which remembers us of the turn of the century. Very close to the Turkish House with the symmetrical facade and xylographical decorations referring to the architecture of the most european out of Islam countries, the houses of two countries (Spain, Portugal) with their architecture strongly influenced by the Islam architecture are situated. The facades of these buildings are ruled by the a sober proportionality and the purity of forms, they are rich in decorations by the abstract geometrical decorations made of glazed ceramics, which endows the buildings with life with its the glittering colourful areas and decoration of the details fascinating the eyes. In the Singing Sea Street houses of countries nearby the Mediterranean Sea: Italy, Malta, Cyprus, Crete, Greece, Bosna and Hercegovina, Dalmatia, Croatia, Slovenia were situated. The fact that the Slovak, Hungarian and Austrian houses are situated next to each other has the special meaning. It shows not only our common history, but it also predicts the common future and the interdependance of the nations in Central Europe. 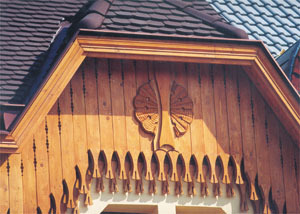 The facade of the Hungarian House is decorated by the wall painting with the motive of the tulips and the top of the tower is made by a forged tree of life. 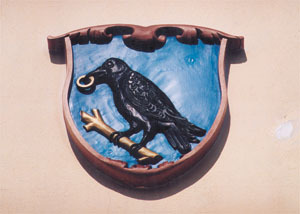 The family coat of arms of king Matthias on the southern facade of the Transylvanian House. This Place makes the architectural wealth of the colourful facades adjusted to the historical atmosphere of the centre really human, as well as the forged shop signs, the street facilities harmonizing with the buildings and the large area of the fountain standing in the middle of the Place. This architecture connecting beauty, purposefulness and quality can release the visitor coming here from the chaos of the bad taste which is caused by the big changes of the recent period. We find this architecture, based on the traditions and historical styles, worth of following also in other the projects connected with the Europe Place.